Blues Warriors? It sure seems that Nighthawks leader and blues harp hurricane, Mark Wenner, and the four equally talented ringers he’s assembled here don’t have to engage in battle at all to keep the real deal alive. These men sweat soul and bleed the blues naturally throughout the dozen dazzlers on this self-titled debut, Wenner’s fifth solo album outside the venerated Washington, D.C. institution that he’s led since 1972. Upright bassist Steve Wolf, well-regarded in jazz and blues circles around D.C., swings with uncommon finesse. When the mood calls for it, such as in “Just To Be With You,” he also thumps the low end with the steady pulse of a faithful heart. Cut most famously by Muddy Waters, that song also features an absolute force of blues nature. Calling oneself “The Blues Man” had better be backed up with the goods. Singer-guitarist Clarence Turner not only lives up to the moniker, but does so in both departments with grit, gravy and real blues awareness to spare. The rhythmic excitement never wavers when listening to his commanding performances, and his booming voice offers excellent counterpoint to Wenner’s reedier rasp. Wenner takes the lead on the Chicago blues shuffle “Checkin’ On My Baby,” but is just as effective rocking and rolling through Slim Harpo’s energetic and immortal “King Bee.” Of course, Wenner also blows melodic flare-ups on his harmonica, in evidence everywhere on the album, but especially as he leads the band through an impromptu take on Sonny Boy Williamson I’s “Trust My Baby.” The man of the hour stands confidently next to any of his heroes, or his contemporaries such as Kim Wilson, by virtue of his chops and feel. Turner and young gun Zach Sweeney both play enough sweet blues guitar during the program to satisfy the most discriminating fans of the instrument. 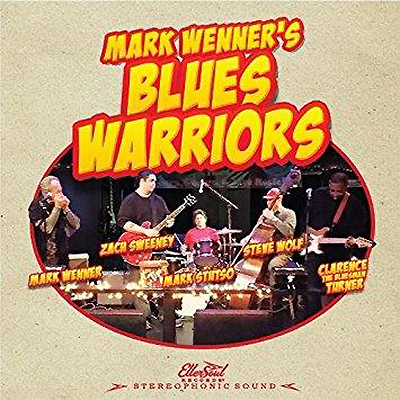 Cut this past February, mixed in March, mastered in April, and now let loose in live room punchy fidelity like the best of them, Mark Wenner’s Blues Warriors should charge to the top of all the “best of the blues in 2018” lists.